Here's the Scottish Recipes tasty and filling vegetarian mince and tatties recipe using the low fat, high protein and fibre Quorn mince. Other vegetarian mince substitutes are readily available from most leading supermarkets. It is quick and easy, making it ideal for a healthier meat free meal for busy families. It takes about 15 minutes to prepare and cook, so it's ideal for a back to school simple and nutritious meal using fresh Scottish vegetables like kale and carrots. This serves four. 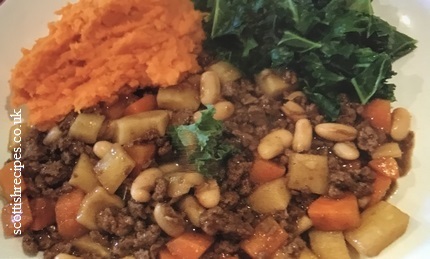 Additional serving of seasonal vegetables, we used kale and sweet potato mash to supplement this vegetarian mince and tatties recipe. 1. Add a small drop of olive oil to a pan. Heat and then add the onion, carrots and parsnips and sweat for 5 minutes. 2. Add the vegetable stock and water and then bring to the boil. 3. Add the Quorn mince and cannellini beans and simmer for 8 minutes. 4. Add a small amount of cornflour if you need to thicken the dish. 5. Serve with accompanying vegetables. See also our traditional Mince and Tatties Recipes and the Mince Round page.